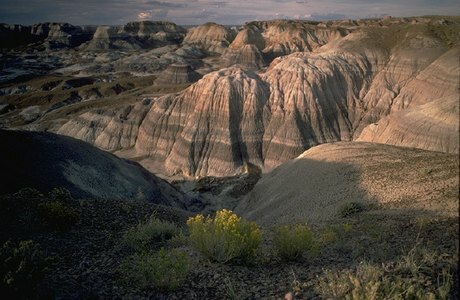 Petrified Forest National Park is a surprising land of scenic wonders and fascinating science. The 93,533 acre park features one of the world's largest and most colorful concentrations of petrified wood, the multi-hued badlands of the Chinle Formation known as the Painted Desert, historic structures, archeological sites, and displays of 225 million year old fossils. Petrified Forest National Park is one of the best examples of the Late Triassic Period, 225 million years ago, in the world. The geologic record contained within the Chinle Formation is well preserved - an open book of time for geologists to read. New fossils are found every year. Our paleontologist averages about two new animal species each year!